UDM Downloads > Word To HTML Converter! Word to HTML converter software change RTF (Rich Text Format), MS-Word, Web, XML, Text format documents. This program converted multiple formats to MS-Word, RTF (Rich Text Format), Web, XML, Text format. With the help of these documents to Webpage translator you can save your important time to linking editing and many other works on web developing these tools simply convert text file to web documents. This application provides best GUI working simple easy and fast conversion tools. This software support MS Word 98,2000,2003,2007 and this software successfully works on Windows 2000, 2003, XP, Vista and Win7 both x32and x64 bits operating system. 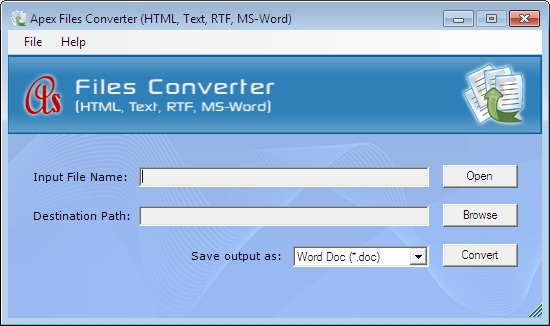 Conversion process is very simple you just select the doc file and select the destination folder for resulting html document and click on convert button to convert then you get a converted HTML file. This conversion tool is creating with very good GUI (Graphical User Interface) and there is no data lose in conversion process. Features: * Compatible with Windows 2000, 2003, XP, Vista and Windows7 both x32 and x64 bit OS. * This tool provides best GUI. * Program supports all text formats. * This tools can converts Text documents into Webpage. * Conversion process is very simple and very easy. * Listen to the text data copied to the clipboard immediately. * Word to web conversion program has very simple, easy to use and user friendly interface. * Using this tool you can save your important time which is waste in formatting editing WebPages. * There is no any data loss in conversion process.